Late Fatima Ibrahim had closed from her place of work, Zubairu Pilot Primary school in Dutsinma town where she teaches Basic Science. Passing through her family home, where she exchanged pleasantries with relatives, she retired home at her residence at the Low-Cost Housing Estate. Little did her family and friends know that they were saying final farewell to her, as her lifeless body was discovered the next day in bed, with blood trickling from her mouth, and bruises on one side of her face. 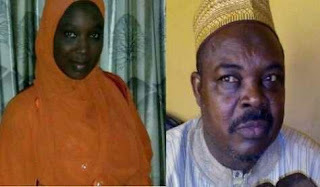 The deceased, a 32-year-old mother, was married to Umar Manu, a staff of the Federal University Dutsinma, Information and Communication Department, who hails from Zaria, Kaduna State and is the prime suspect in the case. The couple have a three-year-old son. Reports gathered that trouble started for late Fatima when her father, Alhaji Ibrahim Habibu, died in December 2014 and she inherited his wealth. He was until his death a regional manager with a major bank in Sokoto. According to late Fatima’s uncle and spokesman of the family, Babangida Habibu, since the death of the father, Manu went all-out to get his wife’s share of the inheritance divided among late Alhaji Habibu’s children. Late Fatima’s uncle said about seven months back, his niece reported her husband’s changing attitude and the family had to intervene, and invited himalong with his parents to iron things out. But, Habibu said, after a while she complained again. “It was at this point that she chose to move out to a new place, where he still visits on the pretence of wanting to see his son,” he said. Manu, according to Habibu, visited the deceased at her residence on the daythe murder was perpetrated, at about 8:30pm, entering in and out of the compound twice before he finally left after 11:00pm. “But the next day, Fatima’s maid met her lifeless body on the bed and raised alarm,” he said, adding that Manu was apprehended and handed over to the police where he has owned up, and confessed to the killing, even narrating how he did it. According to late Fatima’s uncle, the deceased’s family have said all they want now is for the law to take its course. State Commissioner of Police, Abdullahi Usman, who confirmed the arrest of Manu, said investigation has opened up on the matter. Late Fatima was born in 1984, and bagged a Bachelors Degree in Biology from Usman Dan Fodio University, Sokoto.